Frogs are amphibians of the order Anura. There is not much difference between frogs and toads, and they are not classified separately. This is because the toad lifestyle, with its dry, rough, skin, is an adaptation to living in drier habitats. The toad form has evolved a number of times independently, an example of convergent evolution. Frogs can live on land and in fresh water. They cannot survive in salt water. Their development is by metamorphosis. They usually hatch as tadpoles from eggs, which are laid by a female frog. The eggs are called frogspawn. Tadpoles have tails and gills. The next stage, the "froglet," develops lungs to breathe air instead of gills, but still have tails. The fully grown frog has long legs and no tail. Adult frogs can jump with their legs. They have long tongues that they use to catch bugs. They make a sound called a croak. 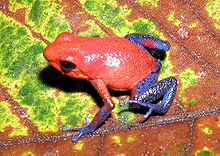 Some species live in trees, and some types of frog are protected by being poisonous. Frogs live all over the world. If a foreign species of frogs is introduced to another country, the local ecosystem might be affected. Frog legs are sometimes eaten as food in France, China, and the Midwest of the United States. The killing of frogs might have an effect on the ecosystem. For example, frogs eat mosquitoes. If frogs are killed, then there are fewer frogs to eat mosquitoes, so more and more mosquitoes are born. Therefore, in these areas, there are more diseases that mosquitoes carry, because there are more mosquitoes. However, for this to apply, frogs would have to be a major predator of mosquitoes. This would only rarely be the case. Frogs are members of the class Lissamphibia, the only class of amphibia which has survived to the present day. Frogs are cold blooded animals. This means that they need heat to keep up their body temperature. If the temperature outside is cold, amphibians will not be active. Amphibians can get heat from the sun, usually indirectly: whereas reptiles can bask in the sun, amphibia usually do not, because it dries their skin. Some frogs aestivate during winter or during droughts. They usually look for underground place to aestivate. These include burrowing in muds and holes. They survive by getting oxygen through their skin. They come out when the weather outside is favourable. Frogs have skin with no scales or hair. They can take in oxygen from either water or air. Mucus that helps their skin to stay wet and slippery. Many amphibians have toxic skin. They have secretions which makes their skin poisonous. 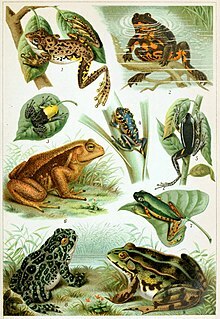 Many frogs are semi-aquatic. They may live on both land and in water, and in any event prefer damp places. These include ponds, swamps, rivers and lakes. Most adults live where they grew up. Most amphibians lay their eggs in foam nests. Even though it is true that most frogs develop from tadpoles, and tadpoles develop from egs laid in water, there are exceptions. Normally the eggs are fertilised after they are laid, that is, outside the body. However, some use internal fertilisation, though how the males do it is not known. When they are fertilised internally, they also lay eggs, but this time the eggs are already fertilised. However, a new species has been discovered in Sulawasi, Indonesia, which gives birth to live tadpoles. The frog is now known as Limnonectes larvaepartus. The Limnonectes family are known as 'fanged frogs' because of twin projections on their lower jaws that are used in fighting. Sulawesi is an island which is rapidly losing its forests. The tropical forest is where this frog lives. Despite these limitations, frogs are widespread, and have adapted to many climates, even deserts. They rely on specific adaptations to survive. Members of the genus Cyclorana live in the Australian central desert. They bury themselves underground where they create a waterproof cocoon in which to aestivate during dry periods. Once it rains, they come out, find a temporary pool, and breed. Egg and tadpole development is very fast in comparison to those of most other frogs, so breeding can be completed before the pond dries up. Some frog species are adapted to a cold environment. The wood frog (Rana sylvatica), whose habitat extends into the Arctic Circle, buries itself in the ground during winter. Although much of its body freezes during this time, it maintains a high concentration of glucose in its vital organs, which protects them from damage. There are a number of tiny tree frogs which develop form eggs laid in water pools on tropical leaves many meters above the ground. Most of these species do not come to the ground except to mate. Tree frogs have evolved a number of times, but they all have almost identical adaptations. Many millions of years of convergent evolution have resulted in almost identical morphology and habits. Overall, frogs are a successful and widespread group. There are about 4,800 recorded species, which is over 85% of living amphibian species. They are one of the five most diverse vertebrate orders. The largest frog is the African Goliath frog (Conraua goliath). The maximum recoreded weight is 3.8 kg (8.4 lb), and a snout-to-vent length of 39 cm (15 in). Paedophryne amauensis is not just the smallest frog, but the smallest vertebrate, 7.7 millimetres (0.30 in) long. ↑ "Cyclorana platycephala". Frogs Australia Network. 2005-02-23. Retrieved 2012-07-20. ↑ Amphibians (2008). "Tree frog info". Animals.howstuffworks.com. Retrieved 2013-06-03. This page was last changed on 8 September 2018, at 10:06.